Since kitting out our GT86 with our Japspeed Sports Cat Manifold and Sports Cat Downpipe we've enjoyed increased power output, improved throttle response and of course, a much more enjoyable soundtrack! The benefits of the Japspeed Sports Cat exhaust components is that they stay on the right side of the law, as by fitting them you will still pass an MOT’s requirement for a catalytic converter to be present (if the car was supplied with one from factory) and they will also keep your emissions levels in check. However, since fitting the Sports Cat Manifold & Downpipe to our own car, we’ve been frequently asked whether or not we will be producing a more simplistic decat version of both parts. We subsequently released our GT86 Decat Manifold and GT86 Decat Downpipe and, in between jobs on our new 370Z drift car build, got them both fitted to our car. Of course, there’d be no point in fitting them without performing the appropriate tests afterwards, so the car was taken back to AC Speedtech for another ECUTek remap, to see how the Decat components responded and affected the car’s performance. While mapping the car, adjustments were made to the variable valve timing and ignition timing. The timing was advanced around 3 degrees throughout the mid range and top end of the rev range, but it was also advanced to a lesser degree at the bottom end so as to ensure that drivability wasn’t affected. The result was a much stronger torque curve mid range, while the lack of low end power that was demonstrated in our previous dyno graph has now also been seen to. As Andy explained, he believes the infamous factory torque dip is caused as a result of the stock manifold, downpipe and catalytic converters, along with Toyota/Subaru’s requirement to keep the car’s emissions below a certain level at a specific rpm range. While our Sports Cat Manifold and Downpipe helped to eradicate the issue, they were still a tad restrictive and thus left us unable to remove the torque dip without resorting to a more extreme map (with a much lower bottom end torque figure). By fitting our Decat items and mapping the car accordingly the car’s torque remains strong in the mid-range while holding torque all the way through to the rev limiter. From enjoying a number of spirited drives in the car we can’t help but agree with what the dyno said – the car’s fun factor has improved ten-fold and it’s an awful lot easier to give it some abuse without dropping off the power band. We also tried a few sixth gear pulls from low speed on the motorway, just to see how the car would respond. While before it would have bogged down at low rpm, now it was pulling like a train right through the rev range. After mapping we took the car back to John Clarkson Autos who, if you remember, is where we originally took the car for dyno testing when we first fitted the Sports Cats and AEM Induction Kit. We returned to John Clarkson earlier today purely to ensure that the car was dyno’d on the same dyno that it always has been, so as to ensure that our figures are relevant to one another and show true power and torque figures. The end result was a peak power figure or 225.6 bhp, with torque peaking at 176.1 lb/ft at 6504rpm. The graph below shows the comparison between the most recent dyno chart (with the Decat components, Japspeed Cat Back Exhaust and AEM Induction Kit fitted) and the previous dyno chart, where the car was fitted with the Sports Cats, Japspeed Cat Back Exhaust and AEM Induction Kit and recorded a peak power output of 217.7 bhp and a peak torque figure of 173.7 lb/ft. More importantly though, you can see the massive difference between the torque curves (the red line shows the previous graph and the blue represents the latest results with the Decats fitted). All of our Japspeed Toyota GT86/Subaru BRZ exhaust components are available from our online store. This entry was posted in News, Products and tagged gt86 on February 27, 2015 by teamjapspeed. If you remember our previous updates to our GT86, we'd set the ball rolling by fitting a set of Eibach Sportline springs, a pair of Buddyclub rear lights and a set of XXR 527 wheels - some nice simple mods that plenty of people will be doing to their own GT86 or BRZ. By this stage we were pleased with the handling improvements we’d made, along with the subtle aesthetic tweaks that had left us with an all round more enjoyable car. However, it was time to start upping the power. Replacing the stock exhaust on any car is always a popular route to take when first starting to modify it and we chose to follow this tried and tested route with our GT86. Introducing our Toyota GT86/Subaru BRZ Sports Cat Manifold, Sports Cat Downpipe and Cat Back Exhaust System. All three items are manufactured from high quality T304 stainless steel and feature TIG welded, CNC machined flanges for a perfect fit. The Sports Cat Manifold & Downpipe replace the OEM catalytic converters, offering improved flow characteristics while still remaining road legal and MOT friendly thanks to the built-in 200cell sports cats. The Cat Back System is 2.5" in diameter and culminates with a pair of 4.5" tailpipes that look suitably aggressive set against the rear bumper and under section. We fitted the exhaust parts at John Clarkson Autos (a fairly local motorsport and dyno specialist) so we could accurately gauge how much of an effect the components would have on the overall power output and torque curve. First things first was to test the car in its standard form! We could barely hear the sound of the standard exhaust note over the sound of the rolling road but the results were a pair of runs at 201bhp and a final run at 203bhp. After a quick cool down we drove the '86 onto the ramp to whip off the standard exhaust system running from the engine back. While removing the centre section and back box are fairly simple affairs, removing the skid plate and heat shield arrangement around the manifold took quite a bit of time. Despite this, replacing the exhaust system from the engine back is very simple and perfectly achievable by those who haven't had any prior experience of modifying their car before. The tools required are no more extensive than a selection of 12, 13 and 14mm spanners and ratchets (with an extension) and a 22mm spanner. These are all you will need to remove and replace the manifold, downpipe, centre section and back box. The end result was an increase of peak power output to 207.5bhp at the top end of the rev range and a drastic improvement sound-wise. Improving a car’s breathing capabilities would not be complete without replacing the factory intake/air box – to do this we chose the AEM Toyota GT86/Subaru BRZ Induction kit. With the exhaust dyno runs complete we removed the standard air box setup from the car. This is an extremely simple process and only took our mechanic Ant a handful of minutes. Fitting the AEM kit is also a simple process (made easier by the included instructions!) and the entire removal and replacement process can be completed with just a flathead screwdriver, a Philips screwdriver, a 10mm ratchet, a 2.5mm allen key and a pair of pliers. With the Induction kit fitted we fired up the car and dyno and set to work on gaining some more figures. Once again the results were conclusive, with power now peaking at 214bhp and torque rising to 164lb/ft! Throttle response was also greatly improved and we enjoyed a much more entertaining drive back to Japspeed HQ now that we had a small power increase and the awesome induction noise and exhaust soundtrack to serenade us! Please note that our car had not been mapped to suit the modifications made it to it at this stage, so the next step was to treat the 86 to an ECUTek remap at AC Speedtech. With the remap complete we took the car back to John Clarkson Autos so we could get a true before and after dyno comparison. Below is a comparison between the car in completely standard form (top graph) and the car with all Japspeed exhaust components, AEM Induction Kit and EcuTek remap fitted (bottom graph). Bearing in mind that, prior to the remap, the before and after dyno graphs followed a very similar shape, the ECUTek remap has made a world of difference. Gone is the flat spot between 3250 and 4750rpm - instead this flat spot is now located below 3250 rpm. In the real world, the car's drivability and fun factor have increased no end, with mid-range feel and responsiveness much-improved and helping to provide a much more enjoyable driving experience! Coupled with the induction roar from the AEM Induction Kit and the pops and bangs of our Japspeed exhaust setup, we're now very happy with the car's breathing setup. With the extra power beneath us we thought it best that we upgrade the braking while we were at it. Enter Tarox and their fantastic GT86/BRZ 326mm Front Big Brake Kit. Consisting of 326mm discs (available in Spiral Groove, Drilled & Grooved and Drilled & Straight Groove configurations), a pair of B32-6 six pot callipers (available in a wide array of colours) and Tarox’s own outstanding brake pads (available in Fast Road, Track and Race specifications) the kit is fully configurable for whatever usage your GT86/BRZ sees the most of, whether it be daily commuting, spirited weekend drives or all-out track use. The kit is also supplied with a pair of high quality braided lines, allowing you to replace the prone-to-perishing stock items and in turn improve braking feel. The larger discs and callipers also fit beneath the OEM wheels, allowing those with more standard looking cars to enjoy improved braking capabilities as well. They also fit perfectly beneath our XXR 527s, while looking absolutely awesome in the process. Overall we were absolutely chuffed with the end result - braking was massively improved and, combined with the increase in power and noise, the car was an absolute joy to throw around the country lanes, despite still remaining civilised when we wanted it to. The next step was to fit some of our new GT86 strut braces and improve the handling that little bit more - more of that in the next update. This entry was posted in News, Products and tagged gt86 on February 23, 2015 by teamjapspeed. Seeing a lowered car without the wheels to go with it is like seeing our beloved Sales Manager Motty without a McDonalds lunch in front of him: the two were born to go hand in hand after all. Having recently decked out our 1JZ Subaru Impreza and V8 S15 drift cars on sets of XXR 527 and 530 wheels (respectively) we didn't have far to look to choose a suitable set for our GT86. Enter a set of 18” XXR 527s, 8.75” wide and finished in bronze to contrast perfectly with our GT86’s white exterior (XXR wheels are available from our online store). When it came wrapping the new wheels in rubber there was only going to be one person to call and that was our long-time tyre sponsors Maxxis. While the tyres on our GT86 won't be being torn to shreds at the same rate as those on our drift cars we knew they'd still have to put up with plenty of abuse, leading to our decision to choose a set of Maxxis' latest MA-Z3s. With an offset of +20 we were hardly going to be pushing the boundaries of wheel fitment but that was never our goal from the outset. The new wheel setup has filled out the arches nicely with only minimal spacing required and, most importantly, required no rolling or modifications to the rear arches or front wings. Plus, they look great! With the basics of the exterior taken care of it was time to turn our attentions back to the handling and maybe even some power gains. Stay tuned! This entry was posted in News, Products and tagged gt86 on August 15, 2014 by teamjapspeed. With so much hype surrounding the Toyota GT86 and Subaru BRZ models we decided that there was only one thing for it: we had to get in on the action and get one for ourselves! Arriving in the Japspeed workshop with less than twenty miles on the clock and the protective seat covers still in place it all looked and felt very nice but, after parking it up next to our V8 S15, we knew that we had to unleash the potential that lurked underneath. It was time to get modifying! Before we could crack on however, Team Japspeed drivers Shane Lynch and Paul Smith decided to take the car for a spin at Anglesey circuit. We could only hope that it returned to the pits in one piece! Thankfully, the car made it back in one piece. While we considered our options with regards to more serious power and suspension modifications, we cracked on with the basics in the meantime and decided to address the cosmetics of the car. First up was a set of Buddyclub LED Tail Lights. The standard rear lights (shown above) are by no means ugly or undesirable but we were completely sold on the Buddyclub items upon opening the box. Plus, they have a built-in blinker function that definitely appealed to the twelve year old inside us all! Installation is very simple, aided by the excellent instructions that are included. If the blinker function isn’t your thing it can easily be disabled should you wish to indicate in a slightly more discreet fashion. The GT86/BRZ platform has been praised worldwide by motoring journalists and critics alike, with the chassis’ playful nature earning it countless awards and accolades. This is all well and good but, every time we walked passed our car we just couldn't help but think that it should be that little bit lower. In comparison to their Pro-Kit range, the Sportline kits offer a greater suspension drop without sacrificing ride quality and comfort. On paper these sounded absolutely perfect and, as soon as they’d arrived at Japspeed HQ, we headed straight to the workshop so we could fit them to the car. Just like the Buddyclub Tail Lights, fitment is simply a case of removing the OEM items and replacing them with the new parts with no other modifications necessary. After removing the dampers, the OEM springs were removed through the help of spring compressors and subsequently replaced with the new Eibach units. With the dampers reassembled it was simply a case of bolting them back onto the car, re-fitting the wheels and then dropping the car back on the ground so we could stand back and admire our handiwork. We were impressed with the new ride height (especially so once the springs had had time to bed in and settle) but we knew that something was still missing. After a quick think we knew what was required and got straight on the phone so we could resolve the issue…stay tuned for the next instalment of our GT86 build! This entry was posted in News, Products and tagged gt86 on July 25, 2014 by teamjapspeed. We are big fans of the Toyota GT86/Subaru BRZ here at Japspeed - so much so that we bought one ourselves! We'll be going into more detail about that later, but for now we are pleased to announce our brand new range of strut and chassis braces available for what is proving to be the car of the moment in the Japanese tuning scene. This entry was posted in News, Products and tagged gt86, products, brz on June 3, 2014 by teamjapspeed. 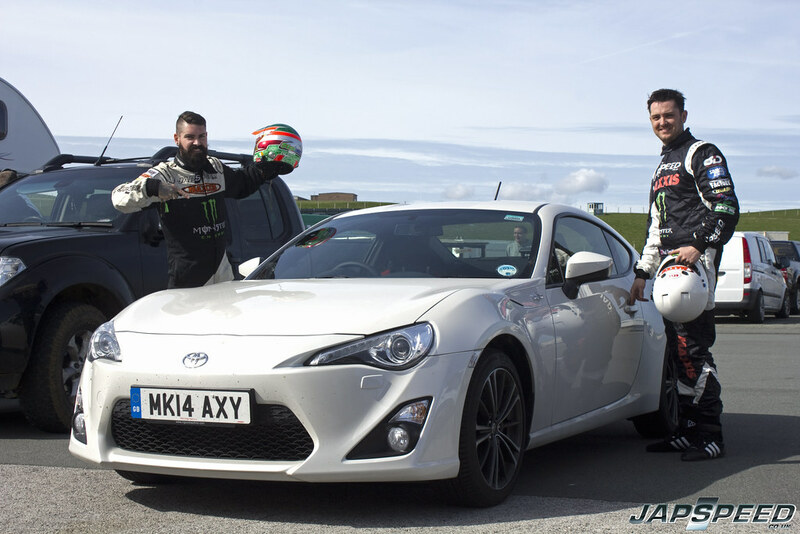 Team Japspeed drivers Shane Lynch, Paul Smith and Shane O'Sullivan headed to Anglesey circuit on Friday to get in some pre-season testing prior to Round 1 of the Maxxis British Drift Championship that takes place this coming weekend at Lydden Hill. While they were there Shane and Paul jumped at the opportunity to take this completely standard and factory fresh Toyota GT86 out on track for a bit of a shakedown...and of course to see how well it would drift! Check out some of the on-board footage below to see how the guys got on. Considering the car has no modifications whatsoever and was driven both to and from the track both drivers were hugely impressed with how well it performed out of the box. Nice work Toyota - we're impressed! This entry was posted in Videos and tagged gt86, teamjapspeed on April 14, 2014 by teamjapspeed. We now have these awesome Buddyclub Toyota GT86/Subaru BRZ LED tail lights available from our online store! If the design wasn't already wild enough for you then there's also the crazy blinker indicator function that can be turned on and off at the push of a button. For just £450 per pair you can completely change the look of your GT86/BRZ - click here to buy yours! This entry was posted in News, Products and tagged gt86, products, brz on April 3, 2014 by teamjapspeed.